Its still cold but the sun is shining and there is no snow. Today there are mini victoria sandwiches in the café, some sewing going on and I will be trying to finish up a project so I can cast on something new. 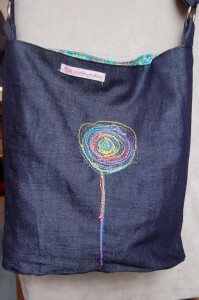 There is a new bag in the shop and a couple of others nearly done, I have been sewing with some lovely embroidery silk hand-dyed by Natalie at the Yarnyard, its gorgeous stuff. I can’t believe I’ve never heard of Victoria Sandwiches before! !